You got laid off and now you’re unemployed — so are 13.7 million other people. Several of Greg McGunagle’s family and friends were among these laid off workers. He started hearing horror stories about how they were let go and began to notice a trend: Few companies are good at executing layoffs. And so the idea of HowIGotLaidOff.com was born. The site joins the ranks of many other unemployment blogs as a place where people can go to cope with being jobless and share their woes with others in the same position. “[It] gives people a place to vent and share their story about being laid off. It also lets people know that there are others out there going through the same thing [or] in some cases, much worse,” McGunagle says. I was on vacation in Florida and called my boss one day because we had a big project launching and I wanted to make sure all was cool with it. He told me that he was happy I called because the company had been sold. He didn’t want me to have to come into an empty office when I got back as we had all been laid off. Nice mindset to be in when you’re on vacation, right? I worked for a nonprofit … one of my main jobs was to help volunteers sign up and prepare for overseas trips to third-world countries. My boss planned a volunteer trip to Africa; more specifically, to a region he was from and had plans to vacation in after the official trip. This particular area had just made the news due to a recent increase of violent outbreaks. Regardless, he took a group of elderly men and women into this war zone, all because he wanted his vacation time. They never made it to their destination; the plane was rerouted to a neighboring country because it was too dangerous. 1. Jettison your anger. Allow yourself to be angry, sad, bitter, upset for a few days and then let it all go. Forgive the company. Forgive your employers. Release the bitterness. Know that you can’t create your future by focusing on the past. 2. Start each day with questions. When you get up each morning, ask yourself this one question: What are the three things I need to do today that will help me find the job and create the success that I desire? Then, take action on those three things every day until you’ve achieved them. This is a great way to keep feeding your positive energy. 3. Take on a positive approach to the recession. Today’s employment-related statistics can be hard to get out of your head when you’re searching for a job. But unlike the pundits on TV who seem all too pleased to focus on the most negative numbers available, you can choose to focus on the flip side, Gordon says. Rather than fixating on 8 percent unemployment, focus on 92 percent employment. 4. Be humble and hungry. Know that you don’t have all the answers and can learn something from everyone, Gordon says. Know that there are always new ways to learn, improve and get better. Be open to advice. Be open to learning a new skill and trying a job you haven’t thought of before. Also, be hungry: Seek out a mentor, take him to lunch and model his success. Think of his life as a blueprint you can follow. Continuously improve and seek out new ideas and new strategies. *Stories have been edited for grammar, language and length. HowIGotLaidOff.com has the right to republish posts and owns all content submitted. Rachel Zupek is a writer and blogger for CareerBuilder.com and its job blog, The Work Buzz. She researches and writes about job search strategy, career management, hiring trends and workplace issues. I learned over the weekend that yet another friend had lost her job. This time, however, it wasn’t because of the economy; her employer thought she was looking for a new job and decided to pre-empt her departure by firing her. Whether or not this was legal or ethical on the part of the employer, what’s done is done. Bottom line: she was fired, it’s a bad economy and she needs a job. First: Of course you’re allowed to feel the effects of losing your job. Take a few days to come to terms with it and re-charge mentally. Don’t, however, look at this as a vacation. You can wake up one day and find out your severance or unemployment has run out and you don’t have another job lined up. Second: You need to approach your job search like a job. Make a to-do list and set goals. It’ll feel great to cross things off your list. Report your progress to someone daily or weekly. Third: Update your resume with quantifiable results. Show how you either saved your previous employers money or made them money. (In my friend’s case, she was a top stylist at a salon and brought in so many clients she was booked solid.) If your “new and improved” resume isn’t bringing in the interviews, go back to the drawing board and make small tweaks to it until your phone starts ringing. Fourth: Stay busy. It’s all too easy to procrastinate — believe me, I’m a world-class procrastinator. Instead, search and apply to as many jobs that fit your skills ever day. Make sure you are networking — online and off — and polishing that online profile. Also, try volunteering and get some sort of exercise. Fifth: Don’t apologize for being out of work. There are many people in your situation these days and hiring managers know this. Instead, focus on how you can excell at the jobs you’re applying to and show how you are the best candidate. Rachel Levy had 10 years of marketing experience and an M.B.A. from a top business school when she was laid off in July. Rather than keep her feelings about the situation private, Ms. Levy started a blog to chronicle her life post-layoff. Her first post was about her best new job opportunity: baby sitting. The former marketing director at the Jewish Community Centers of Greater Boston shared with readers that she had earned $102 from six hours of caring for three young children. It was a far cry from her old salary. “But — end of the day — I just have to look at it as cash in my hand,” wrote Ms. Levy, 37, on her eponymous blog. As layoffs increase, some job seekers are coping by sharing the woes of their searches electronically. For many, it’s therapeutic and a way to connect with others in the same situation. And for some, it’s turned into a way to garner job leads. Ms. Levy says blogging has helped her find a sense of community, as well as show potential employers that she’s keeping up with online marketing trends (a recent post discussed how to use Twitter applications). “It gives me something to talk about in my interviews,” says Ms. Levy. She’s had several networking meetings as a result of strangers perusing her blog. During interviews and meetings, Ms. Levy brings up marketing strategies that she’s kept up with and blogged about as a way to show she is on top of her game. For some, blogging about a layoff helps with staying focused and on track in the search. Sawa Horibe, 37, started tryoutforlife.blogspot.com because she wanted to figure out the next step in her career and chronicle her thoughts. “It’s difficult to see your own progress, and that alone can discourage you,” says Ms. Horibe, who was downsized in November after more than six years of managing Web analytics at Florida Power & Light Co. in Juno Beach. Since starting her blog, Ms. Horibe has examined her own career path and decided to pursue environment-related positions. WSJ Blog: Follow eight out-of-work M.B.A.s as they search for work in a rapidly changing economy. What’s more, the community of onlookers has rallied around many bloggers. Rachel Steinberg, 27, a former public relations account executive in San Francisco, says a blog reader who found her site, recentlylaidoff.com, has helped connect her with contract work during her search. “I had never met him before, but we’re acquaintances now and he still checks in and asks how I’m doing,” says Ms. Steinberg, who was laid off in January. The blogs of the unemployed also draw the interest of other job-seeking readers, which can be a benefit to those who feel alienated after a job loss. Norm Elrod, who started Joblessandless.com after he was laid off for the fourth time in eight years, says his blog makes him feel less isolated. He’s found the community of readers keeps him engaged and integrated. Many of the blogs also act as a repository for résumés and work samples, making them an easy-to-find spot for résumé materials. Many let users download the blogger’s résumé and access portfolios. Ms. Steinberg’s blog directs readers to her LinkedIn profile and uses the posts to showcase her writing. “I try to keep it professional and I try not to get overly explicit,” she says. But not all people follow that protocol and some bloggers have angered former employers with their candid writing. After Luke Kilpatrick, of Half Moon Bay, Calif., wrote on lukek.ca that he “wanted to find a really great job that didn’t give layoffs as a Christmas bonus” his former employer got angry, he says, and demanded that the pricey Macbook Pro that he was allowed to keep in lieu of severance be returned. Still he says he wasn’t deterred. “The more you try to hide stuff, the more people are going to dig,” says Mr. Kilpatrick, who landed a Web developer job three weeks after the incident. 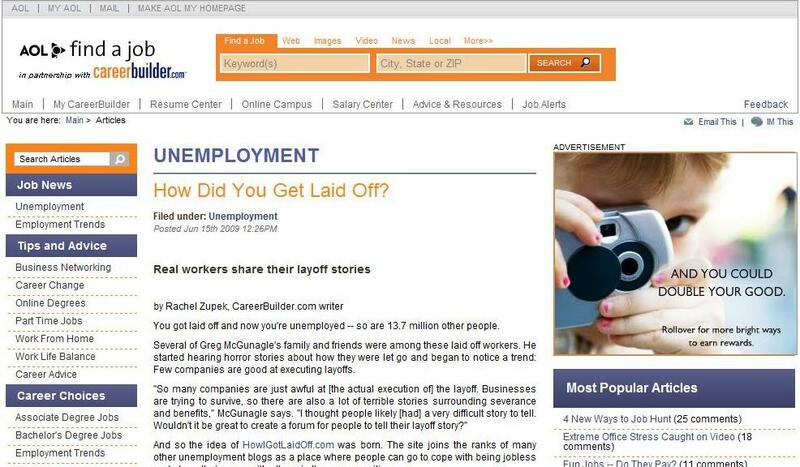 While many laid off bloggers find leads and camaraderie, experts question whether being so open will help land a job. Even a mostly upbeat blog can have dangerous slipups, say recruiters. And one wrong post can hurt a candidate’s chance of getting a valuable interview. Berkeley professor Ms. Chatman warns that having too many personal details available online can be “easily misinterpreted by a potential employer who is interested in hiring the professional you.” Employers might use the information to weed out applicants before conducting an interview. What’s more, Susan Strayer, a career counselor based in Washington, D.C., warns that keeping a blog can turn into a significant time commitment with unknown rewards. “Blogging is addictive,” she says. If you spend too much time writing entries, “it takes away from the search,” says Ms. Strayer, who is also a human-resources executive for a major hotel company. Dan Kaplan, a partner at CTPartners, a New York executive search firm, says sometimes the information can be useful to recruiters. He says he can skim a personal blog and quickly figure out “whether the person is strategic in how they view the world or [if they’re] suffering a bit from victim’s syndrome.” Carefully written blogs can make candidates stand out, Mr. Kaplan says. “If it somehow extends your personal brand, there’s nothing wrong with sharing your view,” he adds. These new blogs collect personal stories, the latest unemployment facts and even haikus to attract the thousands of new job hunters now trolling the web. itainteasybeingpink.blogspot.com: Honest layoff stories from contributors help the blog bring in a host of different perspectives from the unemployment world. 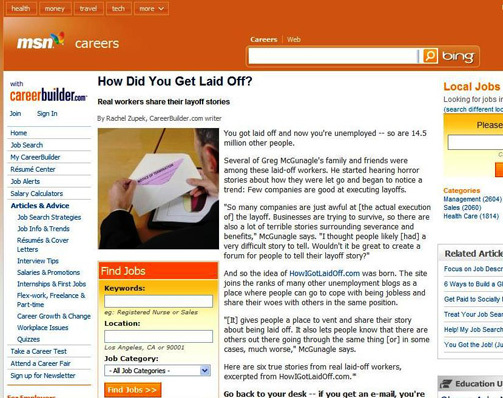 howigotlaidoff.com: The blog chronicles individual layoffs and allows the recently unemployed to anonymously vent about their personal ordeals. the405club.com: Named after the maximum weekly unemployment amount in New York state, the blog provides tidbits about free events and practical advice on topics like health insurance. unemploymenthaikuweekly.blogspot.com: Each blog post is a haiku and cartoon about humorous topics related to unemployment. misspinkslip.wordpress.com: Provides uplifting news and career tips for those looking for work. The blog also tracks happy hours and volunteer opportunities.